As she walks past, her bottom jiggling with each step, the men’s heads turn and their eyebrows rise appreciatively. A wolf whistle would not be out of place, although nobody makes a sound above the noise of the market. 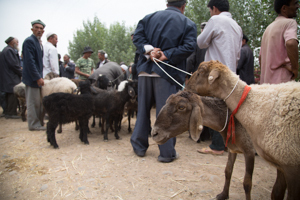 At Kashgar’s livestock market, held each Sunday on a dusty lot on far from town, women are few and far between. Instead it’s the region’s distinctive fat-bottomed sheep that turn heads. 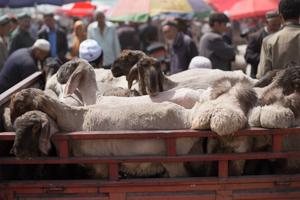 Kashgar’s Sunday market ensured its place in my memory when I witnessed a camel auction here in 1999. The animals were sold alongside heaps of carrots and bales of synthetic silk in the city centre, but by 2007 the local authorities had tired of the chaos that reigned each weekend when hundreds of sheep, cattle, horses and donkeys descended on the town – not to mention the piles of dung they left behind. Since then the livestock section of the market has been separated from the main bazaar and moved twice to successively more distant locations. Today it’s 10 kilometres and a RMB30 taxi ride from the old town (see here for a map). In dividing the market like this its great charm has been somehow diminished. The livestock section is still lively and trade in the main bazaar likewise thrives, but the animal auctions seem remote from everyday life and the bazaar – now covered and open more or less all week – seems dull now that the aforementioned chaos and piles of poo have been banished to the suburbs. But, still, it is a very large market (some say the largest in the world, but how they’ve worked that out is a mystery to me), and it is full of fascinating people wearing interesting hats and doing unusual things, and so both parts will continue to be big draws for visitors and their cameras – as it was for me. I explored the sheep enclosure and laughed at the ewes’ plump little bottoms. I tried to pet some rather aggressive horses and watched a young man ‘test driving’ a black stallion at great speed around a stone-filled parking lot. 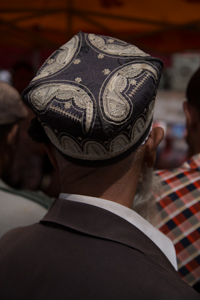 I tried to take surreptitious photos of elderly Uyghur men wearing beautifully embroidered hats and watched a snake oil seller demonstrating his wares. I took pictures of the markets’ solitary camel and her long-lashed calf and discovered that camels make a very melancholy noise – see the video below for evidence. It was very exotic, and more than averagely interesting, but I simply wandered around and took photos, and as a result it felt rather two-dimensional. I was musing on all this as I hailed a cab back into town. I was headed for the ‘Yekshenbe Bazaar’, which I understood to be the covered market back in central Kashgar. 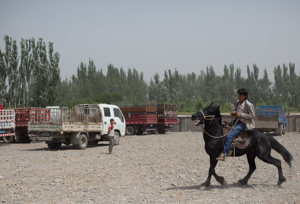 The driver and I agreed an unexpectedly low price, and I was sitting back, absent-mindedly congratulating myself on my bargaining skills and not paying attention to the route when we pulled up somewhere that was definitely not central Kashgar. “Yekshenbe Bazaar?” “Yekshenbe Bazaar.” Confused, I got out of the cab, paid my RMB20, and tried to work out where the hell I was. Slightly perturbed by this turn of events (rather boringly, I generally like to know where I am), I walked slowly through the market. Low-slung tents and canopies shaded tables and stalls. Crowds of shoppers milled around to a soundtrack of phenomenally loud pop music from a stand selling CDs by moustachioed Uyghur crooners. I walked the length of the market and by the time I discovered a brisk market in sheep and donkeys backing onto golden wheat fields my perturbation had turned to delight. Much smaller than the main livestock market I’d just come from, sellers here scooped up their sheep and lambs and carried them around in an embrace to find buyers. In a yard full of trailers stacked high with hay, vendors sat around and talked as they absently played with stray stalks and waited for custom. At one point my camera was commandeered by an ironmonger, who jogged about laughing as he shot wonky photos of his friends before handing it back to me. There was plenty of ice cream for sale, lots of friendly people, no other tourist in sight and a camel – it was brilliant. 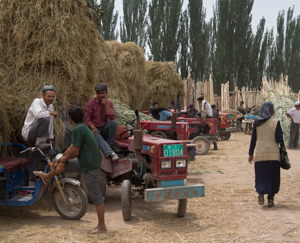 Eventually I found a Chinese speaker and discovered that I was in Shufu, a small provincial town outside Kashgar. 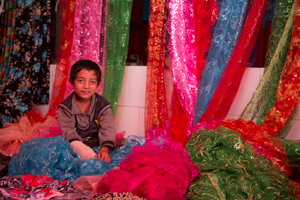 Their weekly market is called, as you may have guessed, the ‘Yekshenbe Bazaar’ – Uyghur for ‘Sunday market’. Given that there are similar markets happening across the region on Sundays, you could end up anywhere asking for a destination like that. Whatever may have been lost in translation, thank goodness for mistakes like this because – as in this instance – they can be the high points of your journey. That and the fat-bottomed sheep. 3) Take pot luck and ask your driver to take you to any Yekshenbe Bazaar – let me now where you end up!